Go-Ahead is one of the UK’s busiest public transport companies, with a focus on urban markets. It is split fairly evenly between rail and bus, with most of the company’s revenues coming from rail, while most of its profits come from regulated and deregulated bus divisions. Public transport is a relatively steady business to be in, and Go-Ahead has a reasonably steady history of revenues, profits and dividends. This defensiveness was one of the the factors that made it an attractive investment back in 2012. The other factor was the low price, which gave the shares a PE ratio of 9.2 and a dividend yield of 6.2%. 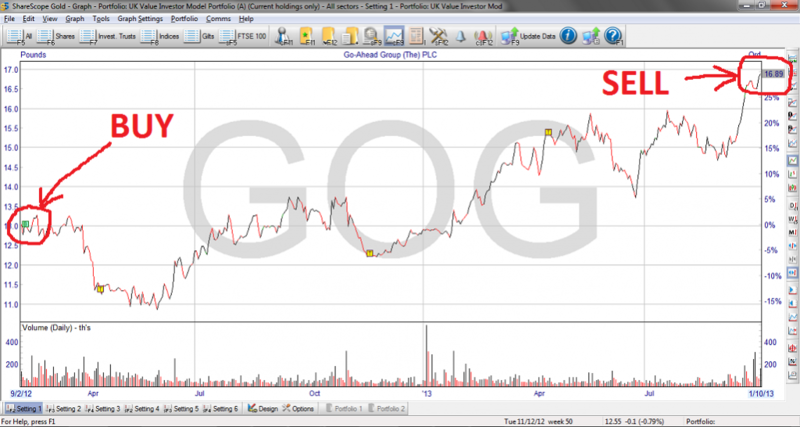 I added Go-Ahead’s shares to the model portfolio on the 13th of February 2012 at a price of 1,304p. Overall the investment paid out 8.1% in dividends while the shares appreciated in value by 28% (as you can see in the ShareScope chart above). This occurred over a holding period of 1 year and 8 months, giving an annualised rate of return of 21.6%. That’s well above the rate that I’d expect the model portfolio to grow at, so all in all I think this was a fairly successful investment. A quick re-cap of the model portfolio’s purpose here might be helpful. The portfolio’s goal is to have a higher dividend yield, as well as higher income and capital growth than the FTSE All-Share. Just as important, it has the goal of being less risky too, as measured by “beta”, but in real terms that means it should fall less than the index when we next hit a bear market. The long-term returns that investors get from the FTSE All-Share come from a combination of dividend income and dividend growth. In aggregate the dividends from all the companies in that index are relatively stable, and growing more often than not. In contrast to the stability of dividends, the index itself is volatile (i.e. risky) over short and long time horizons. This volatility is driven not by the actual results of the underlying companies, but by the market’s sentiment towards a given company, or equities as a whole. If investors think the company will do well, valuations are driven high. If investors think the company will do badly, valuations are driven low. It is these swings between high and low valuations which makes stocks volatile, uncertain and “risky”. In order to have higher income and capital growth than the market, the model portfolio is built from a collection of companies whose aggregate earnings and dividends are expected (based on their past record) to grow faster than the market’s earnings and dividends. Once an investment has been selected, the next thing to do is nothing, or at least, almost nothing (it’s advisable to at least read the RNS announcements so that you can see the latest financial reports and any other significant news). A plant must be left to grow, and you cannot force it to grow by staring at it. The same is true of most investments. It takes years for companies to grow by any significant amount, and so that is the time-frame over which you should expect to invest in and own a company. In Go-Ahead’s case, between the annual reports of 2011 and 2013 (respectively, the latest reports when I made the decision to buy and sell) revenues grew by 12%, 10-year average earnings grew by almost 20%, and the dividend remained unchanged. The market’s estimation of Go-Ahead’s future also changed. When the shares were purchased in 2012 they were being traded for 10.7 times the companies 10-year average earnings. Today the market rates them as being worth 11.7 times the last decade’s average earnings. That change in sentiment, driven partially by Go-Ahead’s so-far-successful project to grow its bus profits to £100m, boosted returns to shareholders by around 9%. Combining the earnings growth, change in valuation and dividend income gives a total return of just over 36%. The decision to sell investments that have had a good run is critical for boosting returns, increasing yields and reducing risks. Holding onto winners is all well and good when it is the company that is “winning”. But holding onto shares where the price has risen far faster than the sales, profits and dividends of the underlying company is a risky strategy. It is the epitome of the greater fool theory, where the investor expects other investors to bid ever higher prices for the company, just because they have in the past. This desire to buy and hold what has gone up is the driving force behind all of the investment manias, from Tulip-mania to the more recent dot-com and housing bubbles. In each case prices were held up by nothing more than wishes and crossed fingers. Gravity, and economic reality, always wins in the end. A better approach is to continuously remove those investments where the price has gone up, yields have gone down, and valuation risks have increased. By replacing those investments with others that have more attractive valuations, returns can be boosted and downside risks reduced. Go-Ahead is another example of how a relatively low risk and, dare I say it, boring company can produce excellent returns if the shares are bought and sold with care. Despite the company’s lack of growth, the 6% starting yield not only lead to dividend gains of 8% during the period of ownership, it was a major factor in the eventual re-rating of the shares which lead to the more than 20% capital gain in less than 2 years. The moral of the story is much the same as it was for the other case studies: Find a steady company with the potential to grow its dividend, buy when the price is low and sell when the price is not so low. Repeating that process over and over again is likely, at the very least, to lead to what Ben Graham called “satisfactory results”. This stock beat the FTSE 250 over the same period by 0.33%. Is this covering the cost of the research you do? In my opinion stick with HSBC FTSE 250 Index fund instead. You still lack the technical analysis when to sell a stock and you lose a lot of performance when selling. When to sell a stock is more important than when you buy it. Having a good selling strategy helps you get the most of your good buying and get rid of stocks that don’t perform in a way that you expect after you buy them. As someone said ‘when situations change, I also change my mind’. Insightful and testing comments as always! I would say that it is news in that it was a company that I sold from the model portfolio and I always evaluate every past investment. I must say that the performance of any of my investments relative to an index over the holding period is just not relevant. I bought Go-Ahead when it was attractively valued. I sold it because it became less attractively valued due to the significant increase in the share price in a relatively short period of time. I can now reinvest the cash (and have done so) into another company which appears to be attractively valued. This decrease in attractiveness due to rapidly rising prices is also true of the FTSE 250. 2 years ago it was more attractively valued than it is today. However, if an investor buys the FTSE 250 and it goes up by 30%+ in less than 2 years, then what do they do? They can sit and hold it for the long-term (which is a good and reasonable strategy) and they will probably get something like 8-10% a year over a multi-decade period. That’s fine. But if they want to sell it and capture that 15%+ annualised return that they have achieved in the last two years, then what do they do once they’ve sold? If they sell the index to capture gains where do they put their money? Unless you have some way of investing in multiple (global) indices based on valuation (which is also a good and reasonable strategy, but not one that I have the data to try out) then you’re stuck in cash. This is the classic market timer’s problem. My approach is to buy good companies when they’re cheap and sell them when they’re less cheap. If I can repeat that feat, over and over again for decades, then the returns have a good chance of being better than the 8-10% that you might optimistically get from index tracking. In that context, Go-Ahead’s return of 15%+ annualised is more than satisfactory because I think I can repeat them ad-infinitum (approximately), which is not something that you can say about the FTSE 250’s returns. As for technical analysis, I am indeed lacking in that area. I spend absolutely no time whatsoever thinking about technical charting factors. When I buy shares I buy the company. When I sell shares I sell the company. The movement of share prices has absolutely no relevance to me in the slightest, other than how the share price relates to the intrinsic value of the business. And finally (after this somewhat long comment), regarding selling strategy and selling stocks that don’t perform, I have the opposite approach. I sell by most successful investments because those are typically the ones where the share price has risen by a large amount in a short period of time, and therefore currently represent less value for money than most of my other investments. I can then sell those high price, low yield investments and buy something else where the valuation is low and the yields are high. So I try to sell winners and avoid buying losers in the first place.